Fresh off the runways of Paris and straight to us in Vancouver come this season’s hottest hairstyles, and there is something cool for everyone. One of the most noticeable changes this season is a clear commitment to looking unstructured. Come this Fall, it’s all about a boho finish and not looking too perfect or too “done.” Fun and easy to achieve at home, these looks can go from day-to-night in a flash by adding either an accessory or a bold lip colour. Here we go, Aria Beauty’s top 3 picks for Autumn hair- and the tools to make it easy. If you’re wearing your hair up, it’s all about the bun this season. Typically worn high on the head, buns are fabulous for “second day hair”, showing off bold makeup (especially super trendy almost-goth purple or rust shades), and dressing up or down. 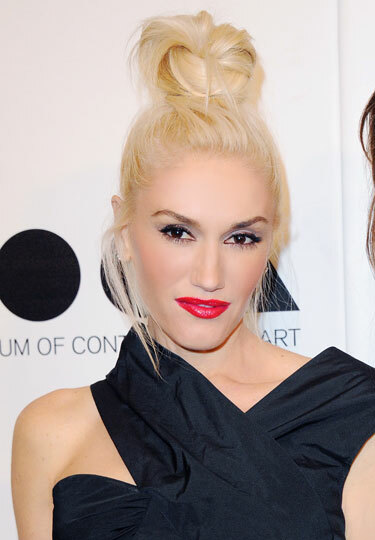 However, the tight dance-school bun has been booted for a softer look as seen on Gwen Stefani here. Once your bun is in place, use the end of a comb to gently pull pieces out at the front so they frame your face and soften the overall look. Must-have tool: Ionic blowdryer to smooth cuticles, prevent frizz, and boost shine. Whether or not you’ve taken the plunge and are sporting 2014’s just-below-the-shoulders layered bob, when you wear your hair down it’s all about long, loose waves with an imperfect finish. The idea is more folk festival than night club: finger styled, a little shaggy, and not cemented into place with hair spray! Kristen Stewart here is effortlessly glam and polished, yet relaxed for a perfect Fall look. Must-have tool: Flat iron. Take 1 inch sections and curl hair midsection to ends, alternating curling hair away from the face, then towards it to avoid looking too perfect. After cooling, use fingers to relax and tousle waves. We see a huge emergence in creativity and shape as braids of all types become one of the biggest statements in hair this year. If you’re after a romantic look, a crown braid is one of the most beautiful and surprisingly easy styles that goes with any face shape. Try adding a jeweled clip or a tucking feathers into the braid for a unique finish. And of course, the long braid is everywhere for Fall: straight down the back, swept to the side, in fishtail form, and braided into ponytails. Fall’s braid is imperfect, so go back in after securing with an elastic and use fingers to gently tug the braid “apart”- softly widening it from base to tail creates a fuller, more boho finish. Must-have tool: 1-inch or larger curling wand. It’s amazing how precurling the hair (doesn’t have to be perfect!) makes hair super easy to control as you braid, and will hold the style for days. Aria Beauty is a Vancouver based hair company making professional styling tools in luxury, gift-box packaging. Find all the tools you need at www.ariabeauty.com or finer salons in BC. Win a Pinkstation Kit (value $369.99) from @Aria_Beauty via @VancityBuzz http://ow.ly/D6FZQ RT to Enter! 2. Follow us on Instagram: @Vancitybuzz. Once you’ve followed, or already following, just let us know via comment that you want to enter the contest. 3. Leave a comment and tell us who is your favourite celebrity. Contest ends October 29, 2014 at 11:59 p.m. One winner will be drawn at random.